We're delighted to announce that the launch for May We Borrow Your Country is on the 26th of January, 2019 at Waterstones, Gower Street. Preti Taneja, winner of the Desmond Elliot Prize, 2018, who has written the foreword for the book, will introduce The Whole Kahani. Contributors will read brief excerpts from the book and publisher Lynn Michell of Linen Press will describe what attracted her to the anthology. This will be followed by a short panel discussion on the representation of minority voices in literature, after which we will be open to Q&A from the audience, and book signing. Do join us for a lively evening with wine and samosas! 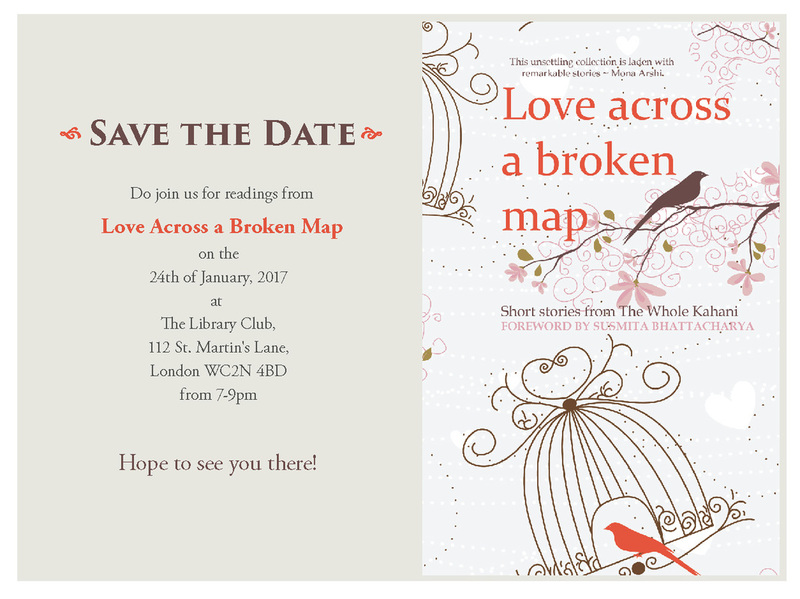 We are super excited to tell you that we will be reading from 'Love Across a Broken Map' at the Short Story Salon at Waterstones, Gower Street in the near future. Watch this space for more details. Heading North please join The Whole Kahani for an event at the Rochdale Literature Festival on the 21st October 2017, where you can hear members read their work and answer any questions you may have about the collective and their writing experiences. Join The Whole Kahani for another exciting event at the prestigious Durham Book Festival on the 14th October 2017, to hear readings and find out more about the group and its members.